US-Iranian Engagement: When and How? On Nowruz, the day when Iranians celebrate the coming of spring and the new Iranian calendar year, President Obama took the helm of American foreign policy towards Iran and dramatically communicated his will to chart a new course away from the failed policies of the past. "My administration is now committed to diplomacy that addresses the full range of issues before us," Obama said in a video message to Iranians. But given the upcoming Iranian presidential elections in June, the real challenge for the United States is when and how to further engage Iran. Obama understands that there are vast areas of convergence between the United States and Iran when it comes to Iraq and Afghanistan, and many more areas where constructive engagement could produce tangible results for both sides. Earlier this month Secretary of State Hillary Clinton announced the administration's plan to invite Iran to a conference on Afghanistan. This meeting, scheduled for next week, could be the launching point for shared action. For instance, the United States and Iran could cooperate to prevent the trafficking of drugs from Afghanistan into Iran, and from there to the rest of the world. The international community would applaud such an undertaking, as it would help to choke the bottleneck of the worldwide opium trade. Stopping drug runners could also help address the immediate political concerns of Iran and the United States by financially starving some of the groups within the Taliban that benefit from such sales. Bringing law and order to Iran's western frontier, where the Iranian army and police are outgunned, outmanned and outwitted by increasingly aggressive smugglers, would weaken or eliminate drug running outfits. Some of these local operators are in alliance with Al Qaeda, which is waging a two-pronged terrorist campaign against both the United States and Iran, as well as the Shi'a populations of Pakistan and Iraq. The announcement of American interest in the shipment of appropriate transportation, reconnaissance and communications hardware to the areas of Iran bordering Afghanistan and Pakistan, where the "war on drugs" is more than a metaphor, would be enormously popular amongst Iranian civil society as well. Successive bumper crops of opium and the virtually free flow of drugs into Iran have dropped the price of heroin in Iran's western provinces lower than that of cigarettes, unleashing an ugly and deeply disheartening epidemic of heroin addiction among Iranians. Many Iranians, including me, have witnessed the wasting away and death of young members of their families due to the scourge of cheap and abundant drugs. One would be hard pressed to imagine a more auspicious opening in Iranian-American relations than scenes of cooperation between the experts of both countries to address a concern common. But before shared action can occur, diplomatic relations must be reinstated. There is no doubt that a great gesture would speak louder than mere promises of a grand bargain. Any diplomatic approach must be combined with some sort of concrete action. After three decades of missed opportunities, Iranians of all political walks are distrustful of furtive missives delivered by cloaked emissaries. Besides, there is always the vexing question of choosing the right interlocutor for negotiations. 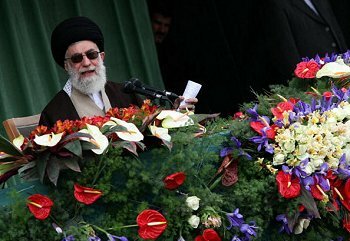 Following Obama's video message, extending a hand directly to the powerful Supreme Leader Ayatollah Ali Khamenei would appear to circumvent the democratically elected parliament and president. And approaching the hardliner President Dr. Mahmoud Ahmadinejad would compound this risk by opening negotiations with a less powerful leader who could be in the lame duck twilight of his presidency. Such an early move could also strengthen his bid for another term. Nor can Obama afford to wait for the results of the June elections because it might radically diminish the goodwill necessary for negotiations in case of a conservative win. The best option is to dispatch the message with an American congressional delegation in an attempt at a dialogue between elective bodies. Regardless of to whom he might convey his words, Obama's goodwill must be readily translatable to dramatic deeds with immediate benefits to both Iran and the United States. Only then can Obama effectively push at the 30-year-old logjam of distrust between the two countries. Ahmad Sadri is the Iranian-born James P. Gorter chair of Islamic world studies at Lake Forest College and a columnist for the Iranian newspaper, Etemade Melli.